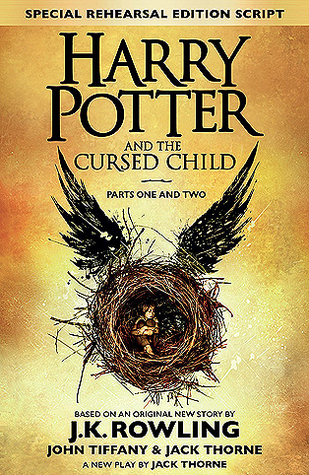 The most magical thing about this wonderful new story was the way in which it transported me back in time to when I would spend the whole day devouring each new Harry Potter book on its release day without looking up from the page. This is exactly how I spent this morning. Once I started I was unable to put this down. I had such an overwhelming feeling of nostalgia once I finished this that it’s taken a few hours to get myself back together to write this review. Is this as good as the original 7 books? No. Is it as magical as the original 7 books? Not quite. Is the plot as incredible as the original 7 books? Not really. BUT and it’s a big BUT. This story is so much more in other ways. It focuses so heavily on the characters and I loved that aspect of it. It was such a treat to catch up with Harry, Hermione, Ron and a host of other original characters (even some surprise appearances) and it was great to learn more of Albus and Scorpius. Of course I missed the gorgeous, detailed narrative that J K Rowling provided in the original 7 but this is a PLAY. It’s not supposed to have all of the narrative we fell in love with all those years ago. It is supposed to be a dialogue with a few written stage directions. I think it is really important that people keep this in mind because I’ve seen a few people saying it disappointed them. I think the reality is that a lot of people expected another full Potter adventure and they would be right in saying that Cursed Child doesn’t deliver that. What it does deliver is a magical stage play with intricate and effective dialogue and plenty of character development. I’m going to talk more about the plot and characters now so if you’ve not read this and don’t want spoilers, please skip to ‘What did I love most’!! The story has plenty going on. It starts straight back where we left off: on platform 9 3/4’s as Albus embarks on his first journey on the Hogwarts Express. We see him sorted into a different house to the rest of his family and a wonderful friendship blossoms between Albus and Scorpius Malfoy. I have to admit that I absolutely loved Scorpius as a character. He was like the anti-Malfoy. Emotional, geeky, loving, emotional and oh so compassionate. In a Triwizard style adventure, we see the true consequences of meddling with time and along the way character relationships break down and then go from strength to strength. I loved the idea of the Time Turners being used again especially as the danger of them was toyed with back in Prisoner of Azkaban. The alternate reality that Scorpius visits is terrifying. Seeing how the magical world could have been so different had Voldemort won the Battle of Hogwarts was chilling. Complete with Umbridge and dementors, this was a creepy little segment. My absolute favourite part of the play was towards the ending when the team travelled to Godric’s Hollow. It absolutely broke my heart to know that Harry was hearing his parents’ murder in real-time and not just in his nightmares. I really liked the fact that this story gave us a glimpse into scenes that had not been explored in the original 7 novels. It felt oh so good to be back in a story with some of my all time favourite characters. Hermione Granger as THE MINISTER FOR MAGIC!! So much YES for this idea! Hermione is possibly my favourite fictional character of all time and to see her in such a position of power was so empowering to me. I loved the little glimpses of her and Ron’s relationship and the interactions between the original three were still amazing. I loved that McGonagall made frequent appearances and that she still scolded Harry, Ron, Hermione and Draco. There was something very real about the way she did that. During the play, I wasn’t sure how I felt about Draco’s involvement and the relationship with Harry but by the end of the book I realised how true this is. So many people put aside their differences for the happiness of their children and I quite liked that this had been done. What I really liked is that this was not done over one or two pages, it was a journey for both Harry and Draco throughout the play and it felt right. I just absolutely adored being back in the magical world with some of my favourite all-time fictional characters. Although it was a very different experience to reading the novels, I just loved the nostalgia that this play gave me. On the whole I actually really liked the plot. Although I had hoped for a bit more of a glimpse into Hogwarts and there were some characters missing who I would have loved to see more from, I thought the ideas behind this were great. There was plenty going on and a glimpse into unseen scenes from the previous Potter books. It might not be quite in the same league as the original 7, but I’ll be damned if this wonderful, nostalgia inducing, magical trip back to my childhood won’t receive 5 stars from me. This was such a treat and I can’t wait to see the stage production bringing this to life! My tickets aren’t until August 2017 but I am already SO excited!! What did you think of Cursed Child? Have you seen the stage play? How does it compare to reading the script? Loved your review!!! I had very similar feelings.